On Friday 11th March members of NCRUG relocated a "Commemorative plaque" to its new home in the flower bed on Platform 1. The plaque was presented to NCRUG in 2013 by Llechwedd Slate caverns to celebrate 150 years of Helsby Junction after it was discovered that the slate used on the roofs at Helsby originated from Llechwedd Slate Caverns. 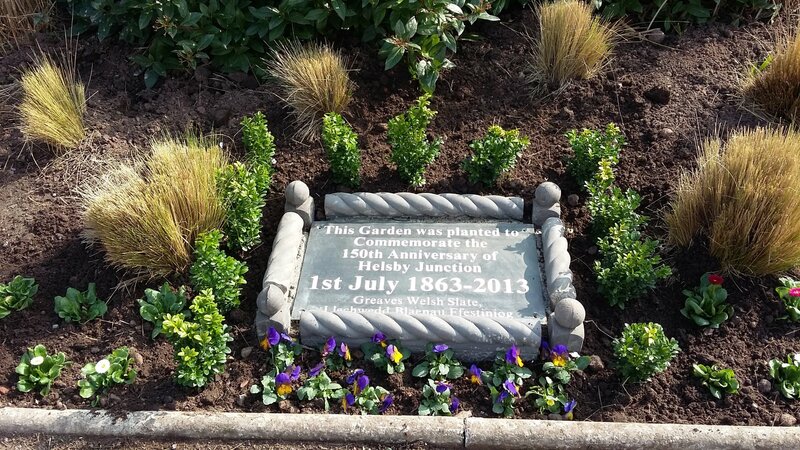 It was unveiled at Helsby in 2013 on the back wall of a new garden that was designed to celebrate the junctions milestone anniversary by local MP Graham Evans but was vandalised some months later and had to be put into storage. A new location has now been found just below where it used to hang on the wall. Its new location in the flower bed comes complete with Victorian style edging and a box hedge.